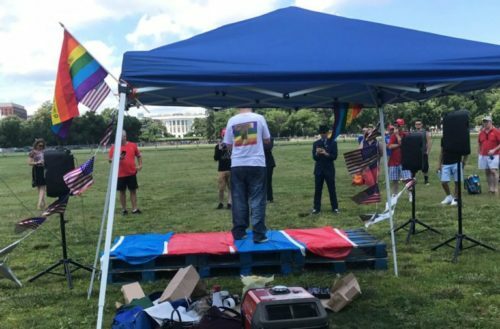 The organization Gays for Trump organized a Make America Great Again Free Speech Rally. It took place on the National Mall near the White House on Saturday, July 1. “MAGAMEGA LLC, a grassroots pro-American organization, announces a MAGA MEGA Rally celebrating those who stand for America, go against the grain or are making a difference and are eager to celebrate the Nation’s birthday the Saturday prior to July 4th,” an official statement announced. Transformational Speaker Dr. Lisa Christiansen and EDM Recording artist Kaya Jones accepted invitations to speak at the event. 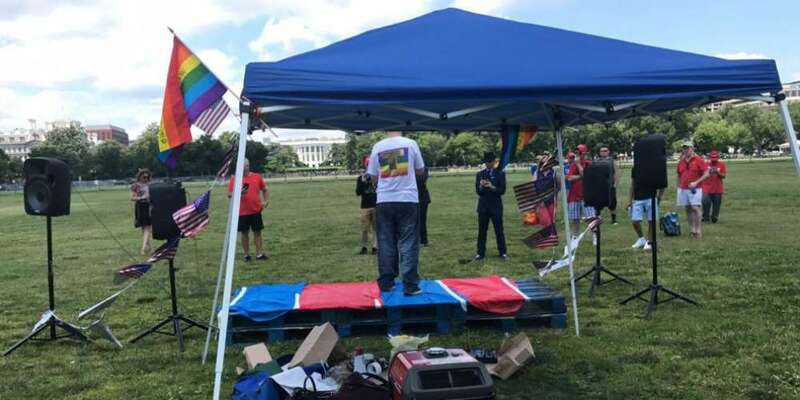 Boykin said that although those expected to speak at the rally will be mostly conservative activists, including LGBT people, who support President Donald Trump, there will be an “open mic” period in which anyone who attends can speak. A GoFundMe was started to raise funds for the rally. It raised $150. That is $1,850 short of its $2,000 goal. Well, today was the big day! A photographer from The Washington Blade shared a pic of the rally Saturday, showing an extremely poor turnout.